Yesterday was my 9 year anniversary with Rene! I can’t believe it’s been 9 years, but it’s been an awesome 9 years. Rene and I are very compatible in a lot of ways which explains why we are not just boyfriend and girlfriend, but also business partners, a complete filmmaking team of two, a video gaming duo, food snobs who search for the best foods together, and best friends! I love Rene more than I can express in words, and I owe a lot of my own personal growth to living and having a relationship with Rene for all these years. I can’t wait to see what the coming years have for us. Unfortunately, we’re currently in the middle of several exciting projects and couldn’t take off the day to properly celebrate the occasion, but we certainly had enough time to have a nice casual dinner out. I like that we’re comfortable enough with each other to not care about celebrating on specific dates, but being able to plan out things when it better suits our busy schedules. We’ll likely do something really fun when we finally finish our current projects. To be more worldly in our culinary culture and keep up with our real food/organic/nutrient dense/pastured/wild way of eating, I’ve been trying to look up organic versions of all the restaurants/foods we like to eat. Today, we decided to seek out an organic Japanese restaurant close enough to our home that we could add it to our regular restaurants we frequent. I found Haru’s Sushi Cafe via a quick Yelp search with some very friendly reviews and some delicious looking pictures of organic yummies. 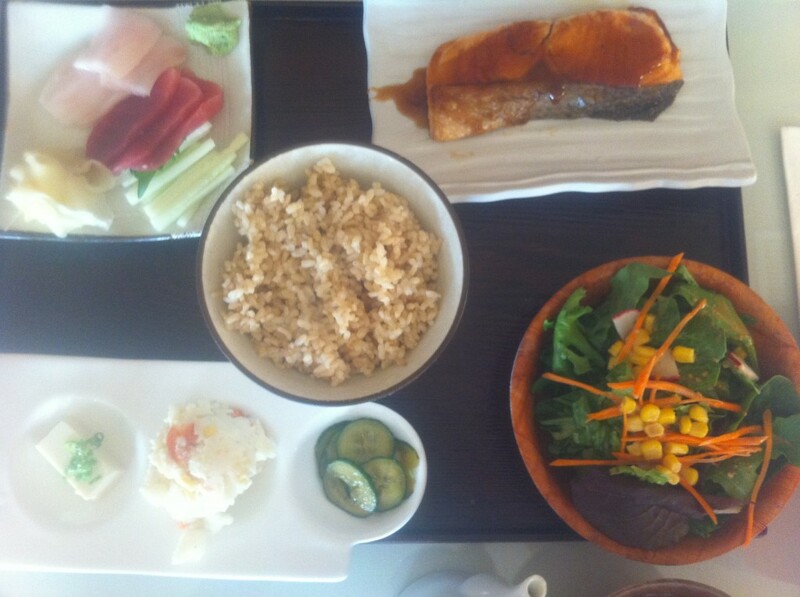 They boasted to have most of their veggies organic, plus wild fish and brown rice sushi rolls. That seemed good enough to us so we set out for dinner! Haru’s Sushi Cafe is a nice little sushi place with a bar and a patio seating area. We arrived early Friday evening, but as we sat eating, the place quickly got busy with lots of customers. The service was great, and all the food was delicious! 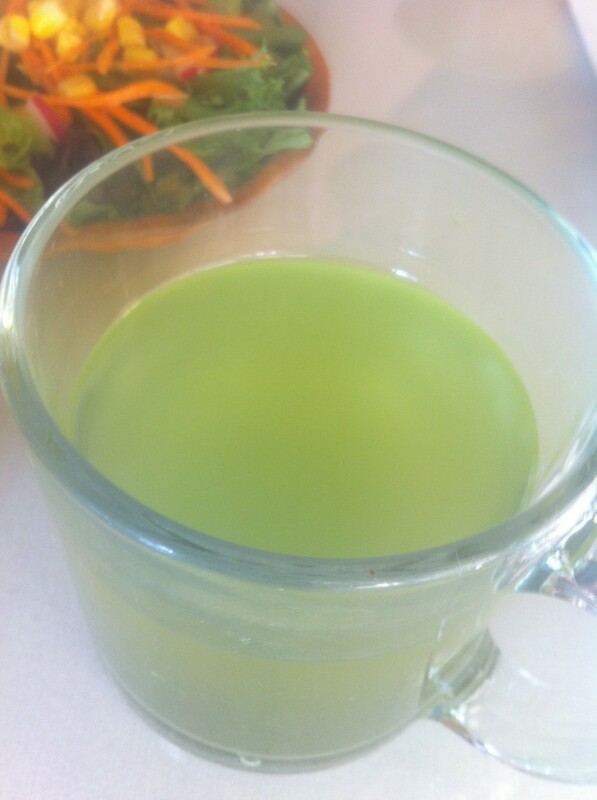 I started with a cup of hot green tea. It was very mild and pleasant, exactly what I wanted after editing video for many hours today. 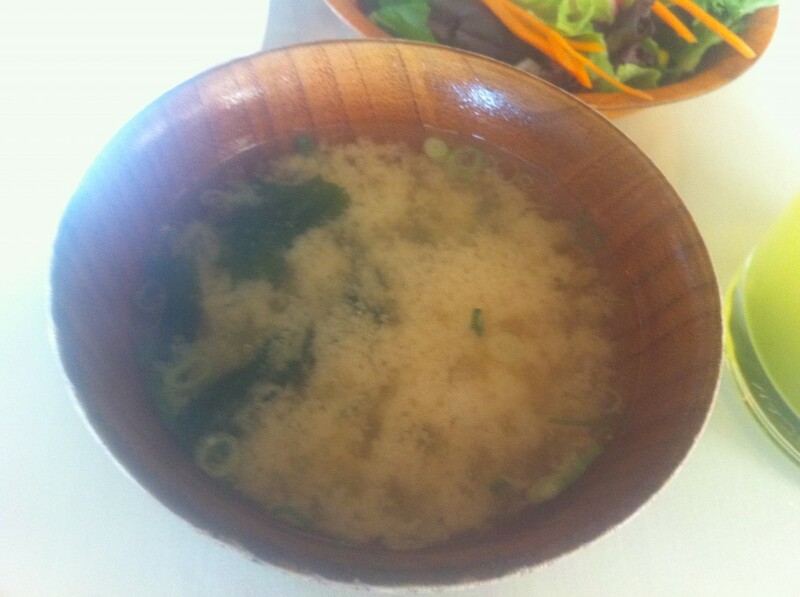 First course for us was a hot bowl of miso soup. Very yummy! And a bowl of mixed organic salad. 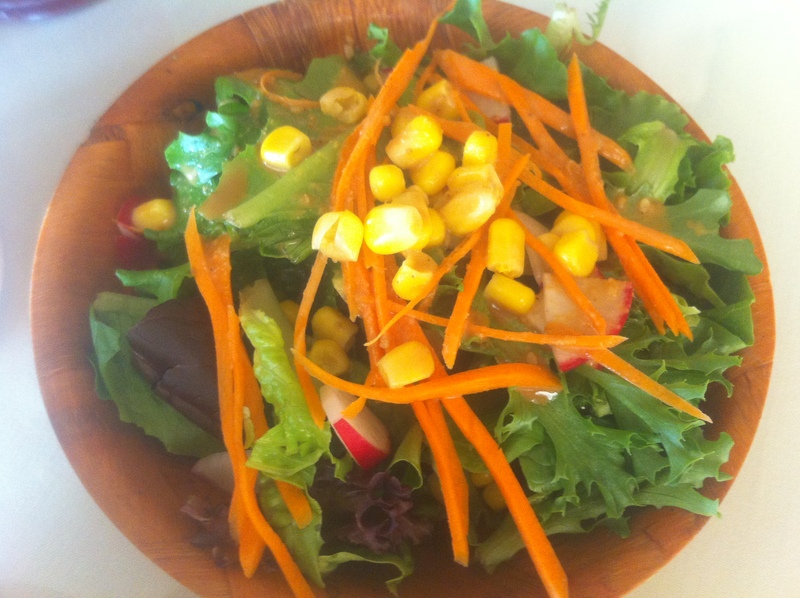 Lettuce, corn, carrots, radish and miso dressing make a surprisingly refreshing mix! 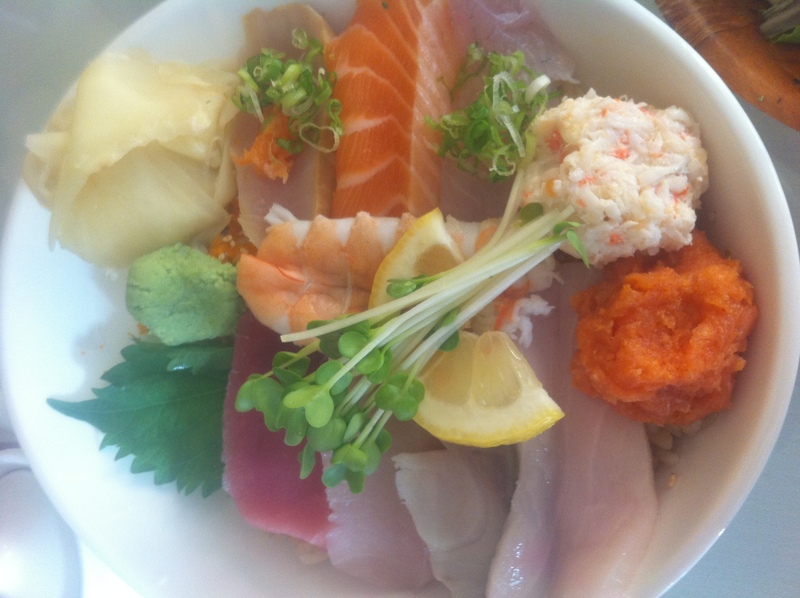 My main course was a Chirashi Bowl. This is my test Japanese Sushi meal to see if a Japanese restaurant is of any quality or not. Haru’s Sushi Cafe passed with flying colors, all the sushi was super fresh, cut into perfect sizes, and there was a great variety of fish. The brown rice underneath all the fish was covered with tons of roe, giving it a great flavor! Rene ordered a combination Salmon Teriyaki and Sashimi Dinner. 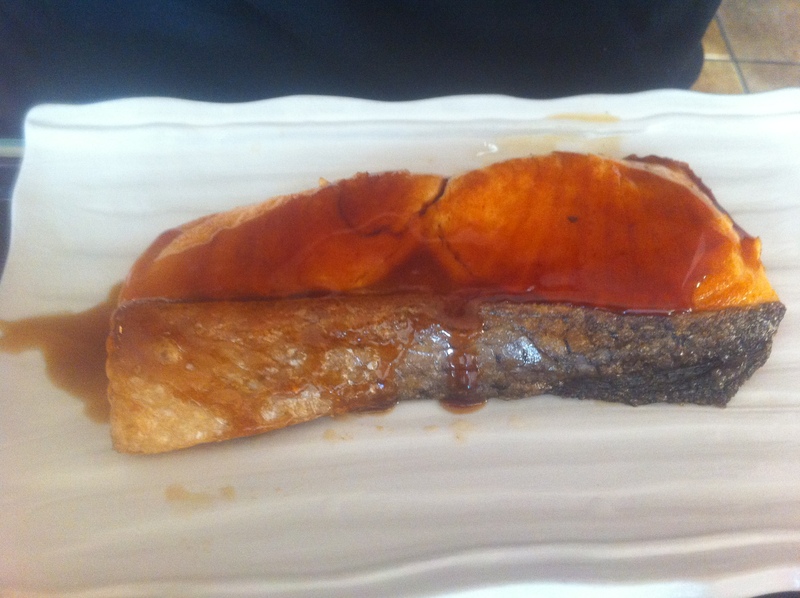 The salmon was wild, which is hard to find at just about any restaurant, and we could definitely tell that it was wild by delicious the flavor. 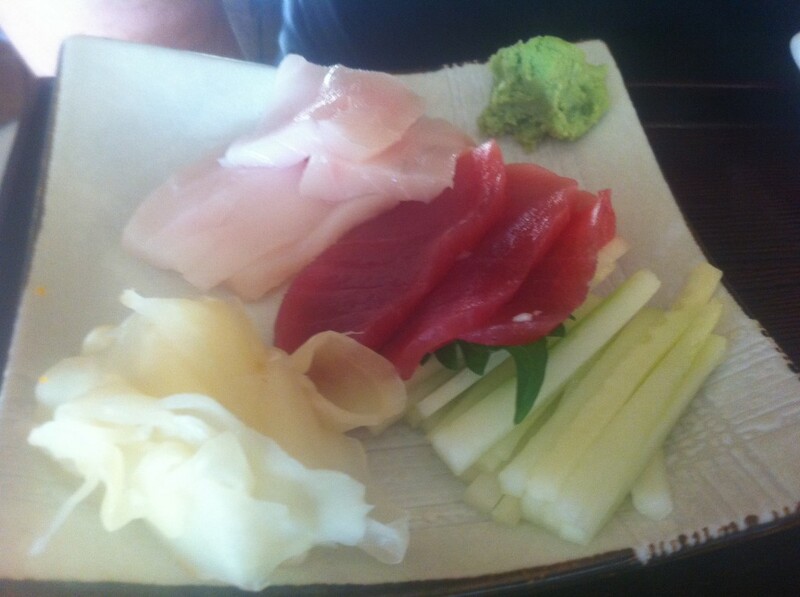 The sashimi, just like the fish in my Chirashi Bowl, was super fresh and delicious. Look how tender each morsel looks! 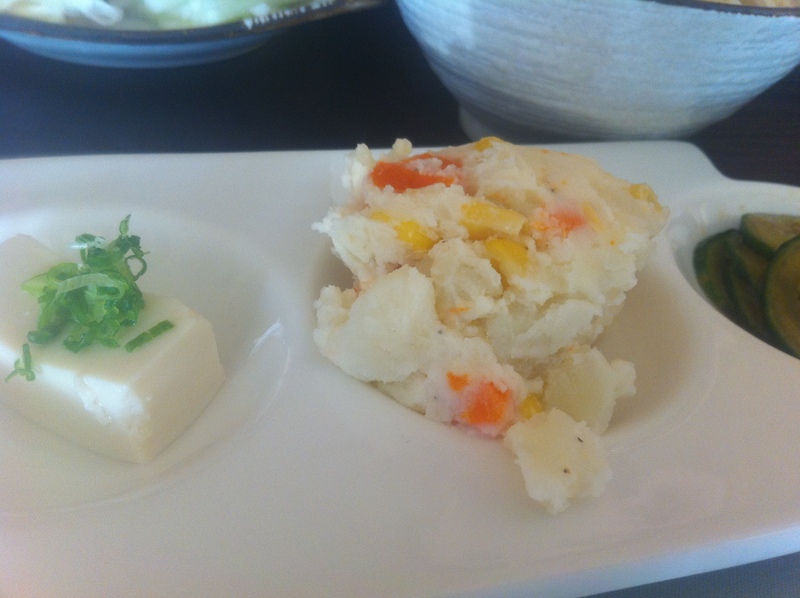 The combination dinner also came with a small scoop of potato salad, a square of tofu, and some pickled cucumbers. Rene and I also shared a Yellowtail Collar so we could get enough fat into our meal. Since we’re both protein types, we need a lot of protein and fat at each meal to feel satisfied. Sushi meals often offers a lot of protein, but very low fat. To balance out our meal, we make sure to always order a fatty fish collar. 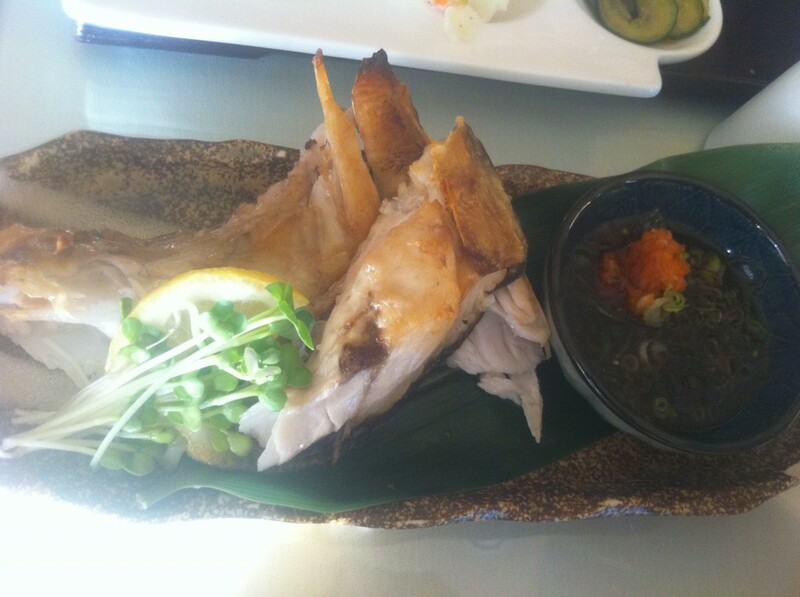 This yellowtail collar was yum, and it came with a specially made dipping sauce, also super yum! Rene also ordered the Peach Tea, which I think may have been a Jamaica (Hibiscus) tea infused with peach. 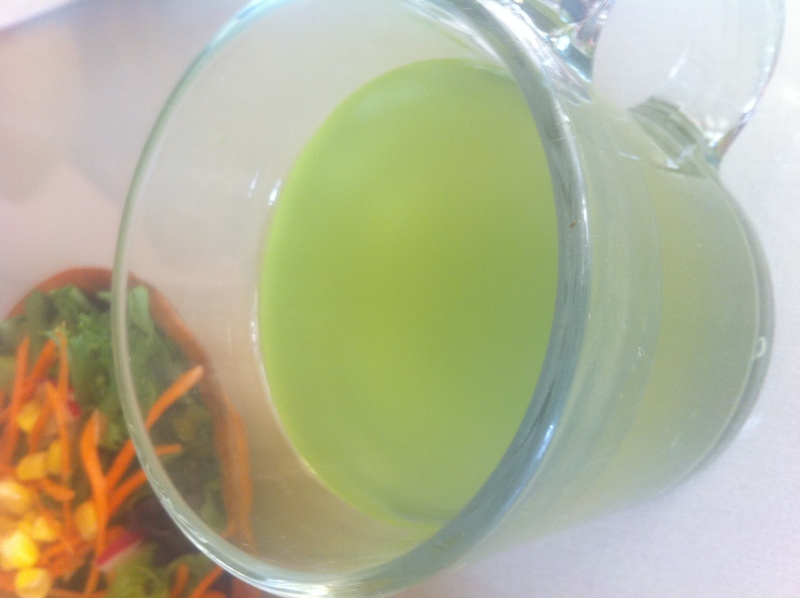 I forgot to take a picture of it, but it was really delicious even though it wasn’t sweetened. Rene loved it so much, he almost walked out of the restaurant with his glass in hand! Needless to say, we had a delicious dinner, and we can’t wait to go back. I’m definitely marking Haru’s Sushi Cafe as our default Japanese restaurant from now on! By the way, I’m not paid to write this about Haru’s, I’m just a food snob that likes to share my awesome finds with others. What’s your favorite Japanese restaurant? Haru’s is located in Los Angeles, but I’d love to find out about all the awesome Japanese restaurants around the world. Some day, I’d like to travel a lot more, and I would love to compare what the rest of the world has to offer in Japanese cuisine, especially in regards to Ramen! I’m in a hunt for the best Ramen around, do you have any to recommend to me? I think it's funny how bloggers show up for a nice meal in a restaurant with our cameras in hand! Never know when a moment will present itself! By the way, now I'm totally craving Japanese, and I'm nowhere near Los Angeles. When people ask me how long you been maried I count from the first year we been together. The official day of mariage is just a paper wrok and it does not count for me and I’m sure this 9 years will be counted as marriage years becuase serious people like my wife and I or you and Rene made their mind and heart very early in the relationship. Go for it girl…what are you wating for? Haha, I guess we decided long ago that marriage wasn’t important for us. You see, both of us didn’t grow up in a nuclear family setting. And we both saw that our single parents were both happy and successful without the addition of a marriage license. If anything, I guess we’re waiting for the day when we decide to procreate, then it might be a good time to reconsider the marriage issue.